All of these photos were taken in Puerto Galera in 2013 with Canon T3i using a Tokina 10-17 mm fisheye lens and a 60 mm macro lens. 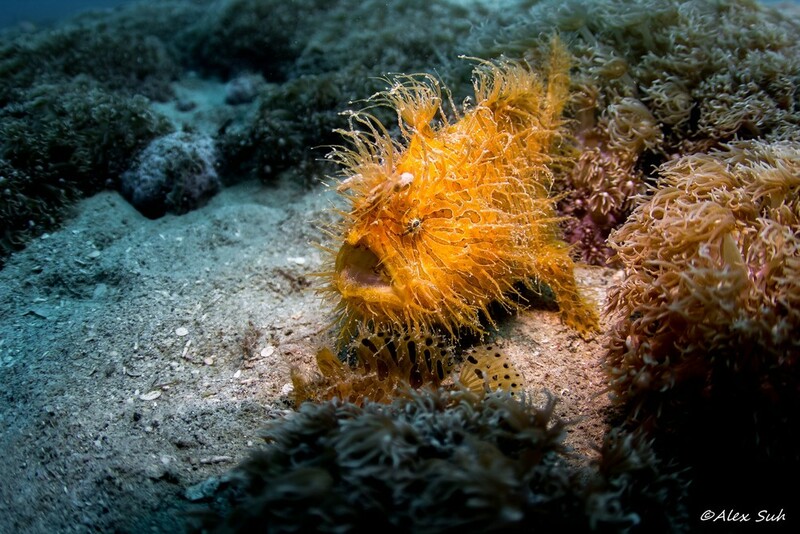 After diving a wreck, I had my wide angle lens on and my guide and another guide was with us saying he had found a hairy frogfish. 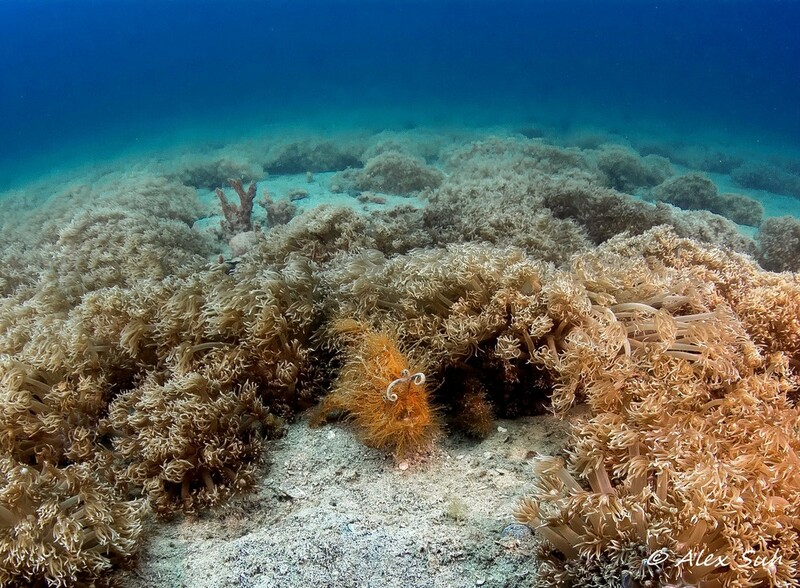 So we dove that spot and I took photos with my wide-angle which was not optimal for such a fish in a very large field of soft coral and somewhat cloudy water at the time. When I surfaced and the guides started talking in excitement about how rare it was to find one, let alone two. I said, what do you mean two? " They said, "You didn't see the baby? ", "What baby?" 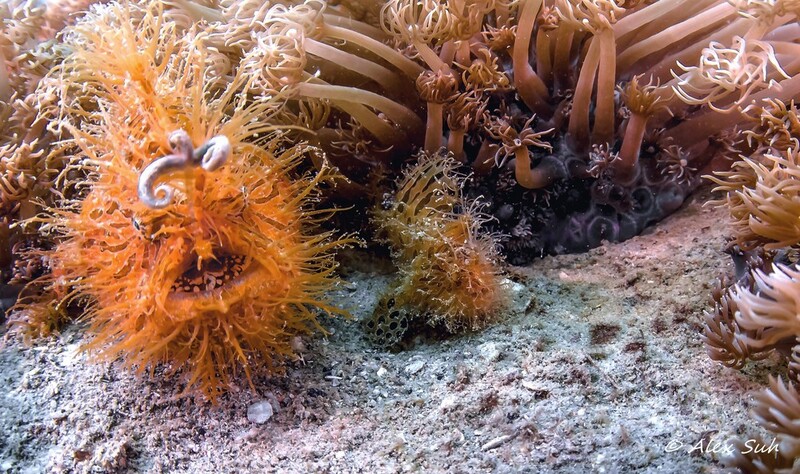 Apparently there was a baby next to the mother hairy frogfish that I never focused on or saw (i'm an idiot) and I could have crushed the baby with my rig if I was not conscious with my rig as a practice unlike some divers. Fortunately, I didn't hurt the surroundings or the baby and actually got some shots of the baby that came in focus which was the good thing about having the wide-angle for this particular time. 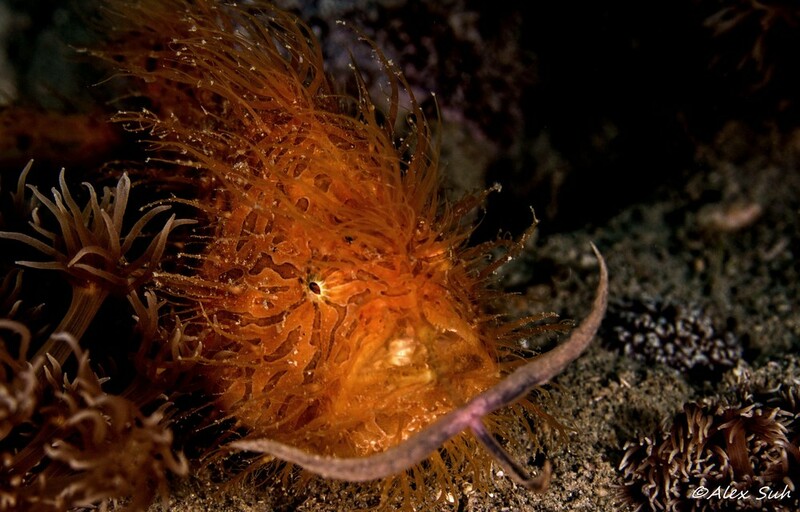 However, later we learned it was not actually a baby and a mother, but the larger frogfish was the female and the smaller one was the male. 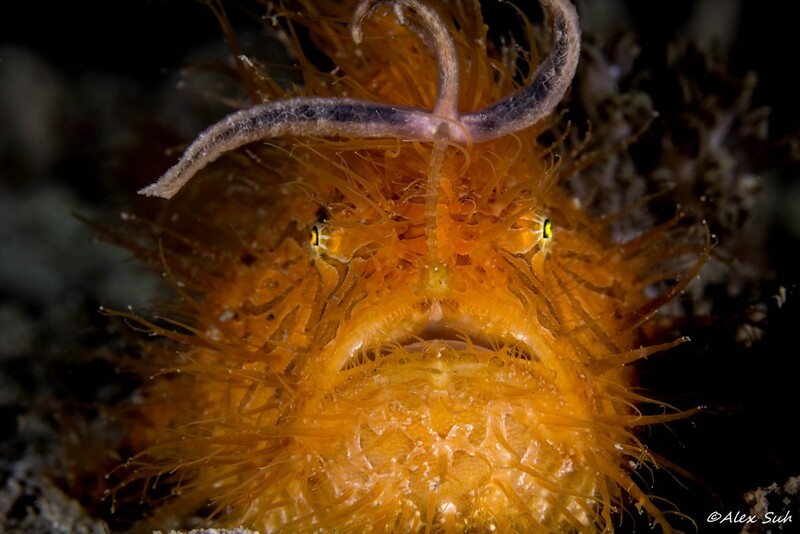 When we returned on the second dive with my macro lens, we never found the pair again, but we were lucky did find the another hairy frogfish and the strange thing was, that while I was taking video and photos, suddenly from above, a lion fish comes swooping down right next to the hairy frogfish where I got some great photos of them interacting. 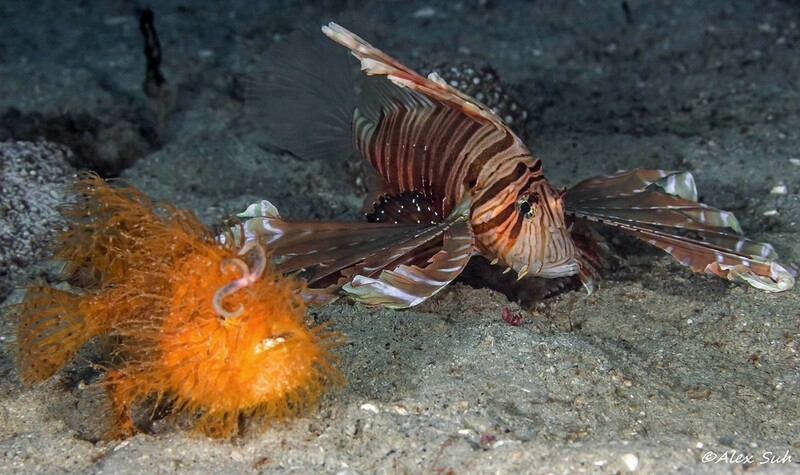 We thought the lion fish was mental at first because he was not intimidated by us and just bouncing all over the place when I realized that he was actually hunting for small clear shrimp in the sand. 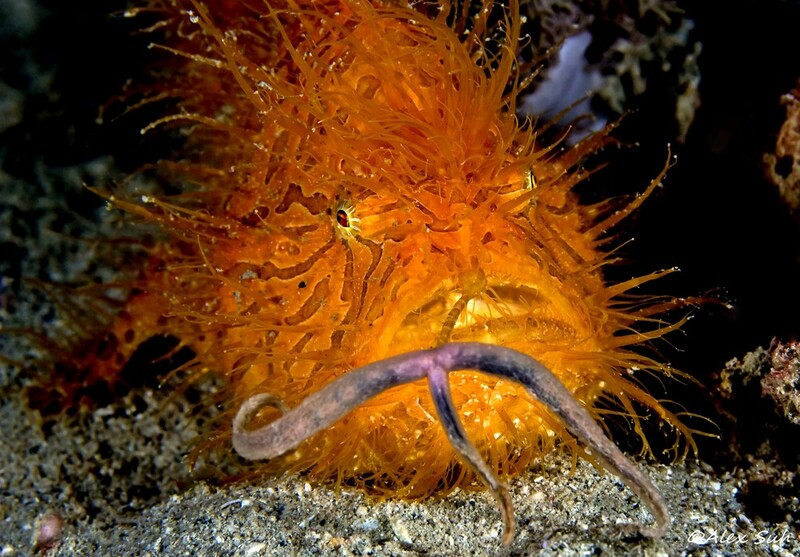 If you look at some of the photos of the hairy frogfish, you can see that he thinks the lion fish is mental too by the expression on his face. You can go to the Video Gallery and see some of the interaction as well. 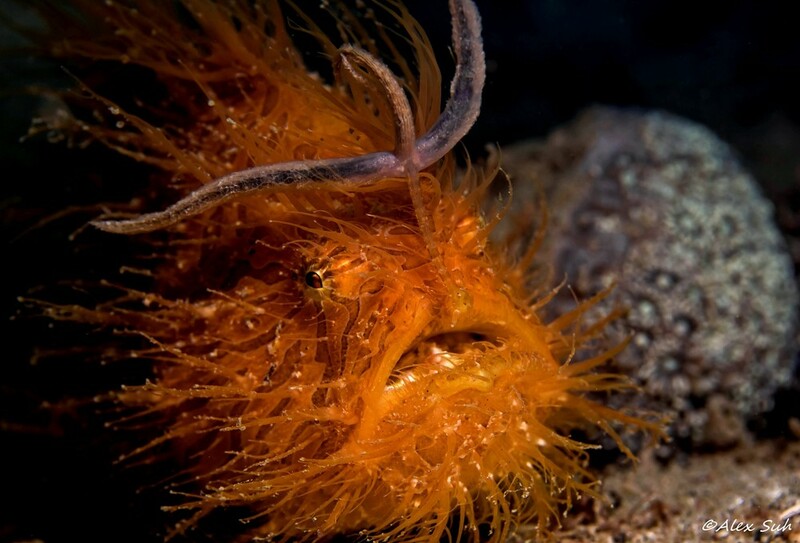 Antennarius striatus, also known as the Hairy Frogfish or Striated Frogfish, belonging to the family Antennariidae.. 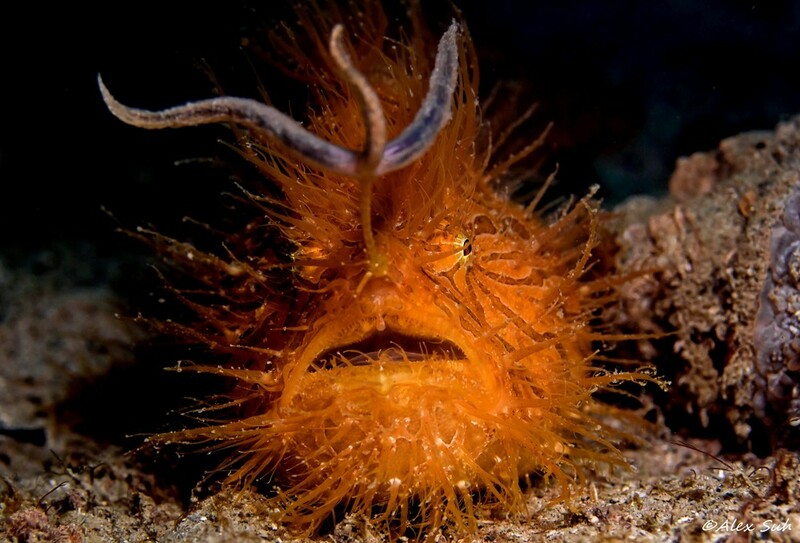 It is a small-sized fish which grows up to 22 centimetres (8.7 in). 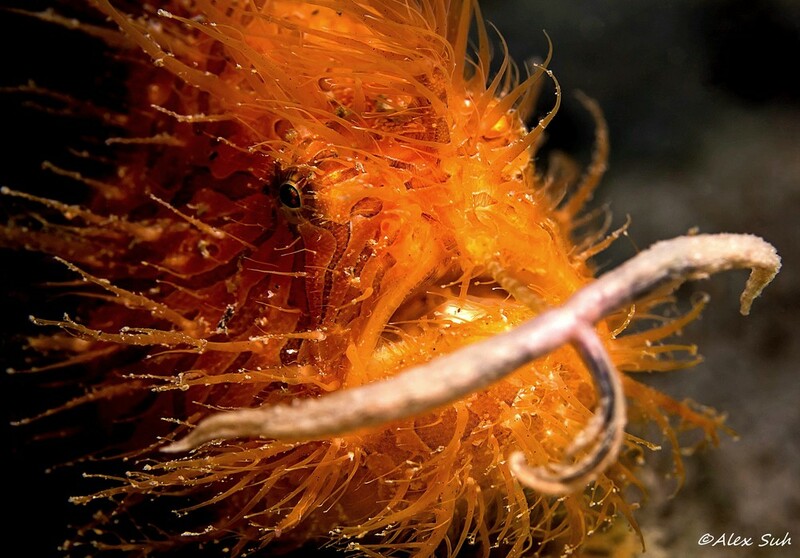 Like other members of its family it has a rounded, extensible body, the soft skin covered with irregularly-arranged dermal spinules resembling hairs. 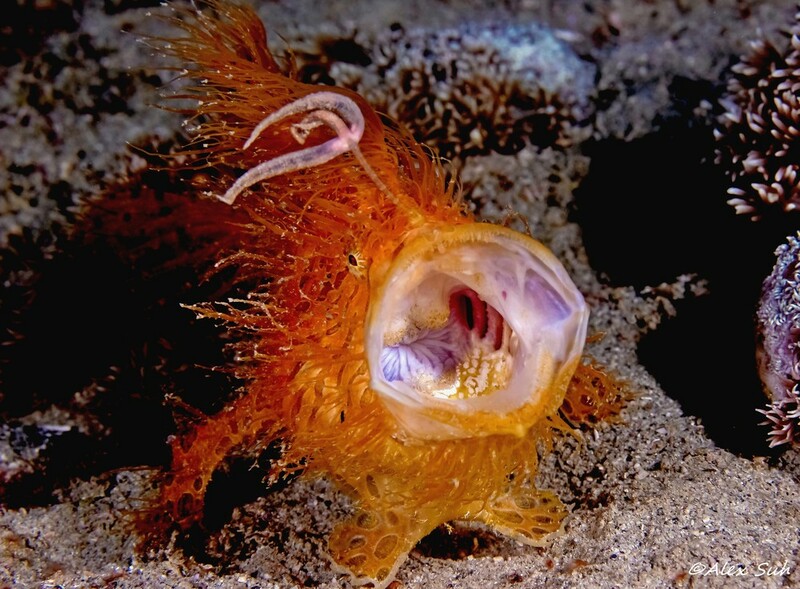 Its large mouth is forwardly extensible, allowing it to swallow prey as big as itself. 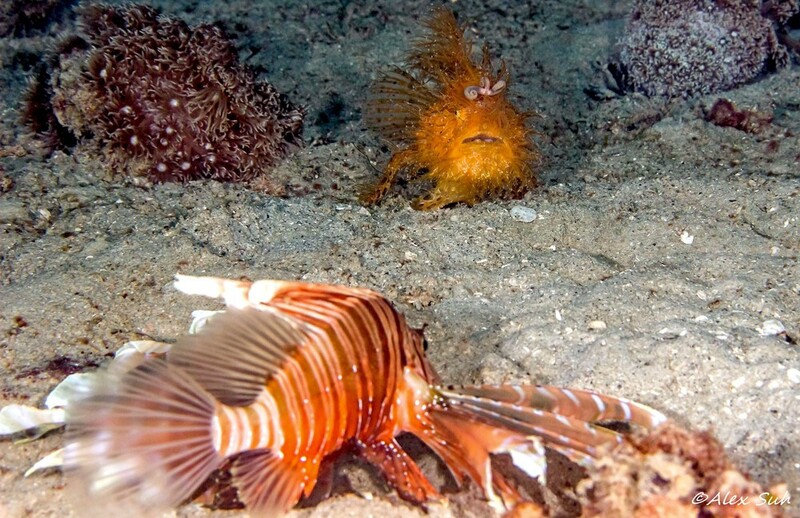 The coloring of the body is extremely variable from one specimen to another because individual fish tend to match their living environment. 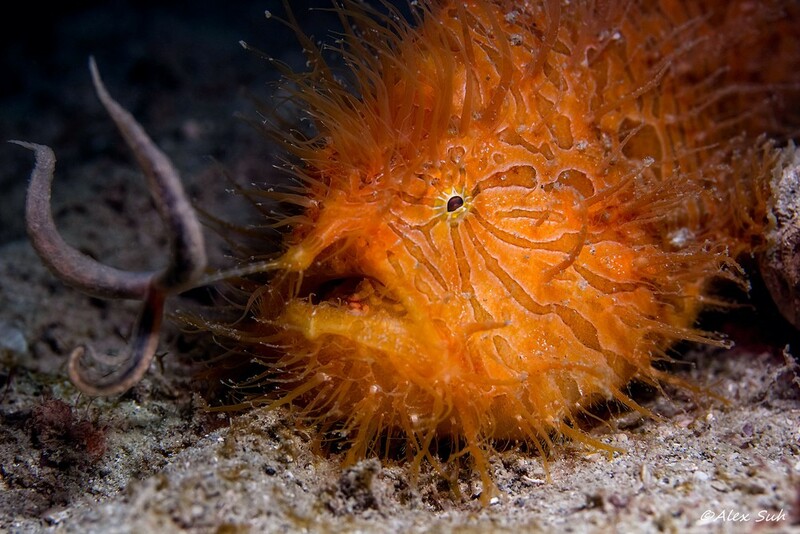 Frogfishes have the capacity to change coloration and pigment pattern, taking only 2 to 5 weeks to adapt. The dominant coloration goes from yellow to brownish orange, passing through a range of shades, but it can also be green,gray, brown, almost white or even completely black without any pattern. Body and fins can be endowed with roughly parallel dark stripes or elongate blotches, some with rays radiating outward from the eye. Source: Wikipedia. Most of these photos were taken with a Canon T3i and 60 mm macro lens or a Tokina 10-17 mm fish-eye lens.